Just as tied-off fringe tassels hold the knots in place from the ends; the side cords hold the knots in place from the sides. The weft (left to right) threads are wrapped around a thick side cord that runs the entire length of the rug (with the warps). This cord holds the rows in place, and is usually (after the weaving is completed) wrapped in wool, cotton, goat hair, or silk. The over-wrapping is usually done in a color that blends well with the overall look of the rug. Sometimes multiple rugs are woven on the same large loom for higher production numbers. When this is done, the rug wefts are shared between the rugs. 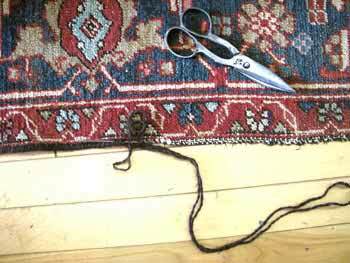 To separate the rugs then, the shared wefts need to be cut. This means that these wefts are not wrapped securely around a side cord. In fact, what is often done is a side cord is already over-wrapped in a matching color and they baste it to each side of the finished rug without securing the “loose” weft threads. This makes the rug “look” right, but there’s a problem with this. Persian rugs are a good example of this type of finishing on the sides. Because the wefts are not secured to the side cords, you can pull hard on the side and literally pull it off. This can happen with a shoe heel, or a vacuum cleaner, or a pet’s bite. And it pulls off almost as if the side is perforated. Some Pakistani rugs are woven in pairs, so there is only one “shared” side that has this problem. And, this weaving characteristics are you find it also in several India and Persian pieces as well. The fear is that you’ll pull the side loose and will begin losing knots. However, this can be fixed by either adding additional securing stitches to the existing side cord (to delay replacement), or by removing the original cord and replacing it with a new one that is properly anchored to the body of the rug. Flip over the sides of your rug onto itself and inspect them to see if there are any loose areas along the sides. If you catch the problem early, it is a very inexpensive repair.